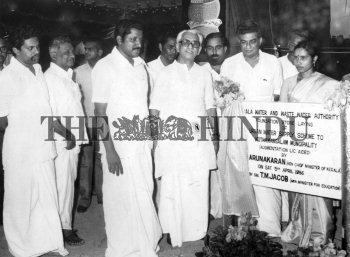 Caption : The Kerala Chief Minister, Mr. K. Karunakaran laid the foundation stone for the urban water supply scheme at Kothamangalam. Mr. T.M.Jacob, Education Minister is on the right side of the CM and P.P.Thankachan, MLA on his left. 1986-04-05.